January 2013 – Fight Aging! One of the side-effects resulting from members of the research community now being far more willing to talk openly about engineering human longevity or building therapies for aging is that university publicity offices are now far more willing to write materials that sound like something the "anti-aging" market would come up with. That's not great, but it is what it is - as for the mass media and marketing, the primary incentives for these folk have nothing to do with truth, accuracy, or helping the public understand the actual relevance of a particular research result. If any of those things happen, it's either by accident or because they help achieve the real goals of the publicity group. Bear that in mind while reading the release materials linked below. Sirtuins have been a hot topic in aging research - largely undeservedly as it turned out - for some years, the large sums of money flowing into that field of research helping to drive enthusiasm for the slow, expensive road of slowing aging by metabolic manipulation. Most of the relevant research community, those who might be working on SENS or other rejuvenation biotechnologies if the money was there, work towards similar goals. They are producing knowledge rather than applications that can influence human lifespan, and have little expectation of producing anything more than knowledge for decades to come. Knowledge is never useless, but this path is not likely to deliver meaningful extension of human life in time to matter to us, nor is it likely to produce technologies that will help people who are already aged. There are a number of different sirtuins, and while research initially focused on SIRT1, it is SIRT3 and SIRT6 that have generated the more interesting results in the past couple of years. SIRT3 is the topic for today, a mitochondrial protein - it is noteworthy to see just how many longevity-related genes and proteins are connected to the mitochondria in some way. Calorie restriction is noted to boost levels of SIRT3, and SIRT3 is thought to promote antioxidant activity in cells, reducing damage in the places where oxidants are produced as a side-effect of the operation of metabolism - something that you can't achieve by ingesting antioxidants, I should add. "When we get older, our system doesn't work as well, and we either generate more oxidative stress or we can't remove it as well, so levels build up. Under this condition, our normal anti-oxidative system can't take care of us, so that's when we need SIRT3 to kick in to boost the anti-oxidant system. However, SIRT3 levels also drop with age, so over time, the system is overwhelmed." Vegetarianism is associated with health benefits such as reduced risk of age-related disease. It is also associated with carrying less of the visceral fat shown to cause harm to long-term health - which on balance probably means a lower calorie intake. As we all know by now, calorie intake has a disproportionate effect on measures of health. So that would seem to be a more plausible mechanism than, say, reduced dietary intake of AGEs or lower levels of methionine. The risk of hospitalisation or death from heart disease is 32% lower in vegetarians than people who eat meat and fish, according to a new study. "Most of the difference in risk is probably caused by effects on cholesterol and blood pressure, and shows the important role of diet in the prevention of heart disease." This is the largest study ever conducted in the UK comparing rates of heart disease between vegetarians and non-vegetarians. The analysis looked at almost 45,000 volunteers from England and Scotland enrolled in the European Prospective Investigation into Cancer and Nutrition (EPIC)-Oxford study, of whom 34% were vegetarian. Such a significant representation of vegetarians is rare in studies of this type, and allowed researchers to make more precise estimates of the relative risks between the two groups. Participants were recruited to the study throughout the 1990s, and completed questionnaires regarding their health and lifestyle when they joined. These included detailed questions on diet and exercise as well as other factors affecting health such as smoking and alcohol consumption. Almost 20,000 participants also had their blood pressures recorded, and gave blood samples for cholesterol testing. The volunteers were tracked until 2009, during which time researchers identified 1235 cases of heart disease. This comprised 169 deaths and 1066 hospital diagnoses, identified through linkage with hospital records and death certificates. The researchers found that vegetarians had lower blood pressures and cholesterol levels than non-vegetarians, which is thought to be the main reason behind their reduced risk of heart disease. Vegetarians typically had lower body mass indices (BMI) and fewer cases of diabetes as a result of their diets, although these were not found to significantly affect the results. If the results are adjusted to exclude the effects of BMI, vegetarians remain 28% less likely to develop heart disease. 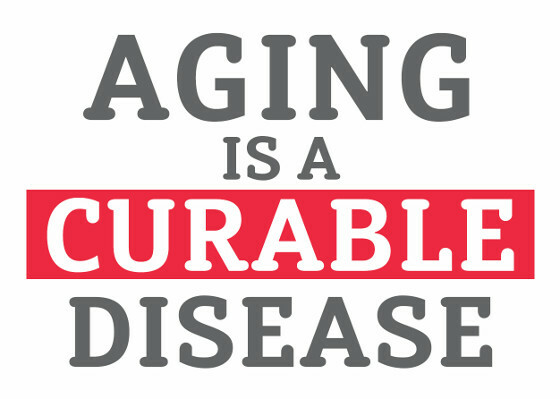 Aging, along with the physical and mental deterioration that characterizes it, is undesirable. Potential economic and social difficulties notwithstanding, living longer and healthier lives is a positive and productive premise. Acceptance of the preceding premise leads to the conclusion that the technology that would facilitate radical life extension ought to be pursued. Dr. Aubrey de Grey, a [biogerontologist] with a formidable beard, offers the argument that it would be morally dubious of us not to develop these technologies and deprive future generations of the benefits therein. To have the ability to develop therapies that lead to longer and healthier lives makes it our responsibility to do so. Policy decisions concerning the adoption and implementation of the policies should be left to those generations in which they are most relevant; it is presumptuous of us to make those decisions for them by not developing these therapies. In his view, it is not only desirable but a moral imperative to give future generations the choice and allow them to decide on implementation. Our hesitation in diverting resources to the development of these therapies is actually condemning future generations to a life span that is far shorter than it could be were we to actively pursue life extension technology. Furthermore, we cannot presume to fully understand the social and political landscape of the future and their priorities - they will be best suited to make a choice and we should allow them to do so. Without going so far as to characterize those opposed to life extension technology as luddites, there is a serious risk of preventing the potential benefits of these technologies from reaching us, or our children, in time. Some people's fear of what may happen if people live ever longer lives is not a basis for pre-emptive policy decisions. Why can't we just focus on the engineering when it comes to aging and our biology? Stuff in our biology is broken, it causes tremendous pain and suffering, not to mention most of the world's deaths, so let's work on fixing it. This seems like a simple enough proposition, one that nobody has issues with when it comes to specific manifestations of aging like heart disease or Alzheimer's. Yet as soon as you talk about fixing the brokenness of aging itself, the very root causes that produce things like heart disease and Alzheimer's, suddenly half of the room wants you to know just how terribly immoral this would be. We do not live in a rational age. Not that any of the others were any better, but still. We should be better - we have the grand sweep of recorded historical irrationality to look back on and learn from. Throughout history people have aged and died because they had to, even as they struggled to live and railed against the inevitable, because there was nothing that could be done. Now there is something that can be done: we can build rejuvenation biotechnologies to repair the known causes of aging. That wasn't plausible centuries ago, or even three decades ago, but it's plausible now. The research and development community is not pursuing this goal in any energetic way, however, and there is no great public clamor for greater longevity through medical technology. So one might argue that the defining characteristic of this new age of ours is that its occupants, presented for the first time with the option to choose life, are instead choosing death. They are choosing death not just for themselves, but for every future individual that might have had the choice to use rejuvenation therapies had the work started now in earnest. A day late is a hundred thousand lives short: aging produces a sweeping, staggering toll of death. More people than you will plausibly meet in a lifetime have died of aging already today. Tomorrow it will happen again, and for every new day until we choose to stop it from happening. Joichi Ito, who as a high-tech investor and director of the MIT Media Lab might be expected to be a natural ally. The lab, after all, aims to be at the center of today's technology revolution. Ito, speaking today at the World Economic Forum in Davos, Switzerland, said he believes the singularity vision puts the wrong priorities first. "I'm on the other side of the singularity guys. I don't think immortality is a good thing," Ito said. People who think about maximizing efficiency "don't think about the ecological, social-network effects. In the future, every science invention we do should be at least neutral," and preferably positive. "When you introduce immortality, you have to think about what does it do to the system. At the Media Lab, our design principle is not to make the world more efficient, but making the system more resilient, more robust." A mighty god, the system - on a par with the environment and society when it comes to people willing to march themselves and others to death in its name. Grouping individuals and then coming to see only the group, to the point of discarding the individuals as worthless, has been all too familiar this past century - with its fervors, its global wars, and its megadeaths. I don't imagine that it'll be any easier going forward to convince people like Ito that saving tens of millions of lives every year is more important than their precious abstractions. Twin studies have estimated the heritability of longevity to be approximately 20-30%. Genome-wide association studies (GWAS) have revealed a large number of determinants of morbidity, but so far, no new polymorphisms have been discovered to be associated with longevity per se in GWAS. We aim to determine whether the genetic architecture of mortality can be explained by single nucleotide polymorphisms (SNPs) associated with common traits and diseases related to mortality. By extensive quality control of published GWAS we created a genetic score from 707 common SNPs associated with 125 diseases or risk factors related with overall mortality. We prospectively studied the association of the genetic score with: (1) time-to-death; (2) incidence of the first of nine major diseases (coronary heart disease, stroke, heart failure, diabetes, dementia, lung, breast, colon and prostate cancers) in two population-based cohorts of Dutch and Swedish individuals (N = 15,039; age range 47-99 years). During a median follow-up of 6.3 years (max 22.2 years), we observed 4,318 deaths and 2,132 incident disease events. The genetic score was significantly associated with time-to-death. The association between the genetic score and incidence of major diseases was stronger. Associations were stronger for individuals dying at older ages. Our findings are compatible with the view of mortality as a complex and highly polygenetic trait, not easily explainable by common genetic variants related to diseases and physiological traits. The aim of the research was to find a biomaterial able to sustain the population of neural stem cells and to generate new differentiated cells in order to start the development of an implant that allows brain regeneration. Despite recent advances in understanding the mechanisms of nerve injury, tissue-engineering solutions for repairing damage in the central nervous system (CNS) remain elusive, owing to the crucial and complex role played by the neural stem cell (NSC) niche. This zone, in which stem cells are retained after embryonic development for the production of new cells, exerts a tight control over many crucial tasks such as growth promotion and the recreation of essential biochemical and physical cues for neural cell differentiation. The team tested types of polylactic acid (PLA) with different proportions of isomers L and D/L, a biodegradable material allowing neural cell adhesion and growth, as materials for nerve regeneration. They found that one type, PLA with a proportion of isomers of 70/30, maintained the important pools of neuronal and glial progenitor cells in vitro. PLA 70/30 was more amorphous, degraded faster and, crucially, released significant amounts of L-lactate, which is essential for the maintenance and differentiation of neural progenitor cells. The results suggest that the introduction of 3D patterns mimicking the architecture of the embryonic NSC niches on PLA70/30-based scaffolds may be a good starting point for the design of brain-implantable devices. [These] will be able to induce or activate existing neural progenitor cells to self-renew and produce new neurons, boosting the CNS regenerative response in situ. Advanced glycation end-products (AGEs) are perhaps the most frustrating of the mechanisms that cause aging. Frustrating because the overwhelming majority of AGEs are of the same basic type in humans - glucosepane - and all it will take to remove this contribution to aging is a designed molecule that can break down this specific compound without harming the rest of our biology. To my eyes finding that basis for therapy is a goal well within reach of a sensible, $20 million, five year program at this time, or pretty much any time over the last decade. Yet no-one is putting more than a pittance into this research, and no more than a handful of researchers pay any attention. This is why development of a glucosepane AGE-breaker therapy is low in the list of plausible near future advances in rejuvenation biotechnology. Not because it's harder than the rest, far from it, but because no-one with a large budget is trying. AGE buildup is one of the root causes of aging. Advanced glycation end-products accumulate as a consequence of the ordinary operation of metabolism, and wherever they lurk in the body they gum up important molecular machinery, deliver harmful signals to cells that spur inflammation, and generally cause all sorts of damage and dysfunction. Aging is no more than unrepaired damage, and as you can see, a part of that stems from something that should be very easy to fix in the grand scheme of things. Yet next to no-one is trying. The SENS Foundation is one of the few groups that does put funding into finding ways to clear glucosepane, but that is still a small amount in the grand scheme of things - certainly nowhere close to millions of dollars yet. You can read a summary at the Foundation website that discusses the science and gives an overview of the current research collaboration. Connective tissue aging and diabetes related comorbidity are associated with compromised tissue function, increased susceptibility to injury, and reduced healing capacity. This has been partly attributed to collagen cross-linking by advanced glycation end-products (AGEs) that accumulate with both age and disease. While such cross-links are believed to alter the physical properties of collagen structures and tissue behavior, existing evidence to support this view is contradictory. In this study, we utilized a rat tail tendon model to quantify the micro-mechanical repercussion of AGEs at the collagen fiber-level. Individual tendon fascicles were incubated with methylglyoxal (MGO), a naturally occurring metabolite known to form AGEs. After incubation in MGO solution or buffer only, tendons were stretched on the stage of a multiphoton confocal microscope and individual collagen fiber stretch and relative fiber sliding were quantified. MGO treatment strongly reduced tissue stress relaxation, with concomitantly increased tissue yield stress and ultimate failure stress. Microscopic analysis of collagen fiber kinematics yielded striking results, with MGO treatment drastically reducing fiber-sliding with a compensatory increase in fiber-stretch. We thus conclude that the main mechanical effect of AGEs is a loss of tissue viscoelasticity driven by matrix-level loss of fiber-fiber sliding. This has potentially important implications to tissue damage accumulation, mechanically regulated cell signaling, and matrix remodeling. The research is part of an international trend in biomedical engineering to create laboratory techniques for growing tissues that are virtually identical to those found in people's bodies. In the new study, researchers combined four types of cells to replicate tissue from the wall of the bronchiole deep inside the lung. "One of the unique things about the magnetic levitation technology is that it allows us to move cells around and arrange them the way that we want for a particular type of tissue. This is the first time anyone has arranged these four cell types in the same way that they are found in lung tissue." The technology is said to rely on inert, non-toxic magnetic nanoparticles that are inserted into the living cells. Researchers can then use magnets to lift and suspend the cells as they grow and divide. "We conducted a number of tests, and the tissue has the same biochemical signature as native tissue. We also used primary cells rather than engineered cells, which is important for toxicological testing because primary cells provide the closest possible match to native cells." "Bronchiole tissue could solve another problem that's frequently encountered in testing the toxicity of airborne agents. With traditional 2D cultures, it is very difficult to culture cells at the air-liquid interface, which is what you'd prefer for toxicity testing. With our technology, we can easily levitate the bronchiole tissue to the air-liquid interface so that airborne toxins are exposed to the epithelial layer of the tissue, just as it would occur in the lungs." One of the most important studies in this area was conducted just last year at Salk's Regulatory Biology Laboratory. In an experiment, biologist Satchidananda Panda and colleagues restricted the feeding of mice to - conveniently enough - an 8-hour period each day. The researchers were attempting to study whether obesity and metabolic diseases like diabetes were the result of high-fat diets, or from the disruption of metabolic cycles. One hundred days later, the free-for-all group was a mess. They gained weight, developed high cholesterol, high blood glucose, and experienced liver damage and diminished motor control. But as for the mice who practiced the intermittent fast, they weighed 28% less and showed no signs of adverse health. These past few years, researchers have produced several demonstrations of extended life and reduced cancer rates in mice through the use of various gene therapy combinations involving increased telomerase expression and extra copies of cancer suppression genes such as P53. You can find an overview of this research and pointers to a review paper back in last year's archives. A few years ago, a Spanish research team created transgenic mice that lived significantly longer than normal by combining increased p53 with increased telomerase. p53 is a cancer suppressor that under usual circumstances reduces the ability of stem cells to replace worn cells in aging tissue - less cell proliferation means a lower chance of cancer over time, but also faster aging as the tissues of the body wear and fail more readily. More telomerase, on the other hand, achieves the opposite end: dynamic, longer lasting cells that also produce way more cancers in the course of their more energetic operations. This, in any case, is the consensus view of how these elements work in the biochemistry of mammals. The researchers recently published results for the next stage of their research program: taking the modifications that had been transgenic to date and instead applying them as gene therapies to adult mice. That was last year. The latest update to arrive this month has the researchers trying out calorie restriction (CR) on their transgenic telomerase-enhanced (TgTERT) mice, with a wild-type (WT) control group. Apparently calorie restriction somewhat synergizes with the effects of additional telomerase, and thus calorie restricted TgTERT mice live longer than their ad libitum peers. Beyond that, this is also a study of how calorie restriction impacts telomere dynamics, finding that it delays the characteristic erosion of telomeres with age - which is consistent with the body of research showing calorie restriction to slow almost all other measurable aspects of aging. First, we showed that the CR protocol used here was able to protect from the development of pathologies associated with aging in both WT and TgTERT mice, including insulin sensitivity and glucose intolerance, as well as protection from bone loss over time. In addition to protection from age-related pathologies, CR improved other aspects of mouse health such neuromuscular coordination in both genotypes. Together, these results indicate that the CR protocol used in this study was able to increase the "health span" of both WT and TgTERT mice. In agreement with this, we observed a delayed onset of first deaths in the WT and TgTERT cohorts under CR. Interestingly, WT mice under CR showed a similar median longevity and similar onset of first deaths to that in TgTERT mice under a control diet, suggesting that TERT transgenic expression is partially the beneficial effects of CR. By using longitudinal telomere length studies, we also describe here that CR delays telomere shortening associated to aging in blood cells from WT mice (PBLs), to an analogous degree to that observed associated to TERT over-expression. Other tissues, such as lung, kidney, bone marrow and muscle, also presented longer telomeres in mice under CR compared to those under the control diet. In agreement with a protection from telomere shortening associated with aging, we also observed that CR protected from telomere-originated DNA damage and chromosomal aberrations. The trouble with ascribing causes and mechanisms to calorie restriction is that it does change everything. So autophagy researchers see it boosting autophagy, telomerase researchers see it changing telomere dynamics, fat metabolism researchers see it affecting fat metabolism, and so forth. So far I think that autophagy has a stronger claim than any other mechanism as being the dominant cause of calorie restriction benefits to health and longevity, if only because removal of mechanisms essential to autophagy has been shown to remove those benefits in some laboratory species. But there's still plenty of room for evidence and debate. The European Commission has selected the two research proposals it will fund to the tune of half-a-billion euros each after a two-year, high-profile contest. The Human Brain Project, led by neuroscientist Henry Markram at the Swiss Federal Institute of Technology (EPFL) in Lausanne, plans to simulate everything known about the human brain in a supercomputer - a breathtaking ambition that has been met with some scepticism (See "Brain in a box"). The final winners were selected from a shortlist of six projects as being the most likely to achieve the paradigm-shifting advances they claim. They will now enter the so-called 'ramp-up' phase, each receiving €54 million over 30 months. That represents the last cash available from the EU's expiring 7th Framework Programme of Research. Subsequent phases will be supported under its successor programme, Horizon 2020, though the structure of that programme is still being negotiated and some observers fear that funds may be scaled back. Doctors may one day treat some forms of blindness by altering the genetic program of the light-sensing cells of the eye. [Working] in mice with retinitis pigmentosa, a disease that causes gradual blindness, the researchers reprogrammed the cells in the eye that enable night vision. The change made the cells more similar to other cells that provide sight during daylight hours and prevented degeneration of the retina, the light-sensing structure in the back of the eye. "We think it may be significantly easier to preserve vision by modifying existing cells in the eye than it would be to introduce new stem cells. A diseased retina is not a hospitable environment for transplanting stem cells. [The] question was, when retinitis pigmentosa is caused by a mutation in a protein only active in rods, can we reduce or stop vision loss by making the cells less rod-like?" The new study focuses on a protein known as Nrl, which influences development of photoreceptors. Cells that make Nrl become rods, while cells that lack the protein become cones. Turning off the Nrl gene in developing mice leads to a retina packed with cone cells. To see if this rod-to-cone change was possible in adult mice, [researchers] created a mouse model of retinitis pigmentosa with an Nrl gene that could be switched on and off by scientists. [In] adult mice, switching off Nrl partially converts the rod cells into cone cells. Building scientific communities with strong ties to the broader public runs in just the same way as building any community in this day and age - which means very differently to the way things used to be. The internet, open data, and cheap global communication allow a whole new layer of activism and effort by small groups of researchers to stand beside the traditional conferences, funding sources, and institutional relationships. The successful research community of today will be a lot more in touch with the public who stand to benefit from its work, and with the advocates and activists who support progress in the field. You might look at calorie restriction research as an example of strong ties between researchers and advocates, leading to a greater number of human research programs and a greater visibility for calorie restriction as a lifestyle choice. Similarly for aging research: efforts like the Methuselah Foundation and SENS Research Foundation have emerged as much from visionaries and support outside the research community as from the work of those within. It may be easier to build communities these days, but that doesn't mean it's easy. Effort is definitely involved, along with some measure of fortuitous happenstance, the upkeep of watering holes and initiatives, a need for strong personalities to make and maintain diverse connections, the creation of collaboration tools and outreach programs. The list goes on. Research labs generally remain local and closed places that do not interact much with other ones, even if it were beneficial for both. In many cases this a matter of distance and not knowing each other, which some summarize as follows:"science improves at the rate of congresses". Luckily we are not the first ones to try to optimise and systematize research, in biogerontology in particular: pioneers have created important bricks for the grand edifice. We have the ingredients and now we need to create a recipe to be adopted by aging research This was clearly highlighted at the Eurosymposium on Healthy Ageing (EHA2012, organised by Heales in Brussels, and where various members of the International Longevity Alliance met). The need for a centralized place for collaboration against aging was strongly raised and a few days later emails were springing on the matter, with names like "Collaborative Resource for Gerontology" (by Georg Fullen, who presented Denigma at EHA2012) or "inSilicoSENS" (by Aubrey de Grey, where SENS = Strategies to Engineer Negligible Senescence). There is a fair amount of this sort of sentiment in the broader research community these days: towards open publishing, greater transparency, relationships established with philanthropists and supporters in the public. It is the mood of the times, enabled by the falling cost of communication and the increasing capacity of the internet. But mood of the times or not, it still takes people to do the work, bang the drum, build the tools. A man strives for justice, but the most unjust thing in life is the inevitability of death. Here's a small child, then an adult, he learns, grows up, falls in love, gets married - divorce, have children, he is happy and suffering, dreaming and disappointed, laughing and crying, running, resting, but for all that the fate is death, imminent death due to aging. Monstrous injustice! A man with his life does not deserve death. People put up with this situation, they talk about natural dying, saying that a person must make room. These excuses have the sound of death due to frustration, due to a lack of knowledge about the theoretical possibilities of science, not a desire to act rationally. A person finds it easier to accept death and aging than to begin to act. So the struggle with death and aging: a complex internal decision, the decision to confront the established foundations, the victory of reason over faith and the desire for psychological comfort, the victory over short-term interest. In 20 years it will not matter exactly what you ate today, what color your wallpaper, and where you go to relax - only one thing will be important, how you confronted death in our day. And in a hundred years, nothing that you are or do now will be important if aging is not defeated. "But what about Pushkin? Everyone remembers him!" - Pushkin would love to change places with you, as he is dead while you are alive and can act. The memory of a man is not the man himself. The good works of Pushkin do not help him in any way nor are a compensation for his dying. Conversely, a victory over aging grants a continuation and the opportunity to do many things. Transhumanism is the desire for freedom. Freedom is possibility. Pain, suffering and aging limit our possibilities. Death reduces them to zero. Improving people via the new nano-, bio-, info-technology of the 21st century offers opportunities only dreamed of by philosophers of the past. It is important to take action. If the 2045 initiative continues onwards as the founder intends, we're all going to be hearing more about what here is called "cybernetic immortality" - copying the data of the mind to run in machinery that is much more robust and longer-lasting than its biological equivalent. I consider the popularity of this goal (as put forward by Ray Kurzweil, for example) something of an existential threat, insofar as it may drain enthusiasm and allies from work on rejuvenation biotechnology now, and in future decades it may become cheaper to build mind-copies than to finalize the means to reverse and prevent aging in our biological bodies. You don't need to fully understand the brain to copy it given powerful enough computers and scanning tools, and you don't need to understand aging much better than we do today to create rejuvenation biotechnology. There are more than enough people in the world who consider a copy of themselves a suitable continuation to support this sort of technology in preference over medicine for rejuvenation. Today a person can choose to support programs like SENS research on the rejuvenation side or the 2045 group on the mind copying side - it's not just talk, it's a rather important choice between aiming for continued survival of the self or aiming for death while a copy of you survives. Cybernetic immortality - fantasy or scientific problem? I can answer that right away. It is a scientific problem - of approximately the same type as the problem of people going into outer space, which was proposed by Tsiolkovsky at the turn of the 20th century. Why, despite the support of important scientists (such as V. Turchin, C. Joslyn, R. Kurzweil, A. Bolonkin, B. Bainbridge and others), is this idea rejected by many, or at best treated with skepticism? There are many reasons for this. Firstly: the scale of this super-project, which really does verge on fantasy, is too "overwhelming", for the "average" scientific mindset, which is mundane and cautious, and too dependent on the opinion of the scientific management. Anything is proposed nowadays if financing can be secured for it. I'm not even talking about the colossal growth of false science - charlatans, mages, "miracle-workers". All of this throws a shadow on the idea of cybernetic immortality. What is the basis for the conviction that the problem of cybernetic immortality is a real scientific problem? It does not contradict the principles of science. In fact, it finds a theoretical basis in them - above all, in the fundamental principle of the iso-functionalism of systems, which essentially heralded the beginning of the computer era. The idea of this principle is that the same complex of functions may be reproduced on substrates with different physical properties. Hence the fundamental possibility to reproduce the functions of a living system and the brain on non-biological substrates, which also fully applies to mental functions. Even if the probability of quickly finding a technological method to delay or reverse senescence is low, we have been devoting far too little effort to it. After all, no matter what else we might achieve with our work in life, we soon won't be around to enjoy it. There are other problems on the planet to worry about, but none more personally important. And yet, despite this motivation, there is very little money being spent on longevity research. Because there is no history of success, and because of widely held religious beliefs, government won't fund it. And because achieving success will be difficult, and the marketplace is flooded with false claims, industry has little interest in solving the problem. Although the profit could be astronomical, there is no easy path to attain it, unlike for cosmetic improvements. Over a hundred times more money is spent on R&D for curing baldness than for curing aging. We may someday find ourselves with extended lifespans as an unintended side effect of taking a pill that gives us fuller hair. This absurd situation is typical for high-risk, high-reward research in an area without an established record of success. Even with strong motivation, financial support is nearly nonexistent. Scientists working on life extension often lack for equipment or a livable salary, and risk their careers by conducting oddball research that repeatedly fails. The problems are hard. But even with limited resources, a handful of scientists are devoting their lives to the pursuit, because of what's at stake. Success will require research on a similar scale as the Manhattan Project, but government and industry won't be supporting it. The greatest hope is that private individuals will step forward and fund the research directly, or through organizations established for that purpose. Maybe an eccentric, farsighted billionaire will want a chance at not dying. Or maybe many people will contribute small amounts to make it happen. This is being done, to some extent, and it gives me hope. Personally, I know I am not so different than other people. I also have a very difficult time accepting mortality. When I think about all who have and will be lost, and my own impending nonexistence, it makes me ill. It's entirely possible that the hope I have for a technological solution to aging and death is biased by my own aversion to the abyss. Being realistic, given our current rate of technological advance, although I'm hopeful that radical life extension will happen before I die, I think it's more likely that I'll just miss it. Either way, whether aging is cured within my lifetime or afterwards, it won't happen soon enough. Good people are suffering and dying, and that needs to change in a way that's never been done before. The more people who set out to propagate this message with style and flair, the better all our chances become. Money is the root obstacle, a lack of funding for rejuvenation research based on the SENS vision that is well planned but moving slowly - but persuasion can move money to where it is needed. You just need enough of it. Most rodents are small and short-lived, but several lineages have independently evolved long lifespans without a concomitant increase in body-mass. Most notable are the two subterranean species naked mole rat (NMR) and blind mole rat (BMR) which have maximum lifespans of 32 and 21 years, respectively. The longevity of these species has sparked interest in the tumor suppression strategies that may have also evolved, because for many rodent species (including mice, rats, guinea pigs, gerbils, and hamsters) tumors are a major source of late-life mortality. Here, we review the recent literature on anti-cancer mechanisms in long-lived rodents. Both NMR and BMR seem to have developed tumor defenses that rely on extra-cellular signals. However, while the NMR relies on a form of contact inhibition to suppress growth, the BMR evolved a mechanism mediated by the release of interferon, and rapid necrotic cell death. Although both organisms ultimately rely on canonical downstream tumor suppressors (pRB and p53) the studies reveal species can evolve different strategies to achieve tumor-resistance. Importantly, studies of these cancer-resistant rodents may benefit human health if such mechanisms can be activated in human cells. To carry out the study, researchers used young mice - just three months old - and reduced their caloric intake by 40% before observing them until the end of their life cycle. "We see that mice that undergo caloric restriction show a lower telomere shortening rate than those fed with a normal diet. These mice therefore have longer telomeres as adults, as well as lower rates of chromosome anomalies." To study the effects of this phenomenon on the health of the mammals, researchers observed the incidence of age-related illnesses like cancer. The mice that had been fed a lower calorie intake showed a reduction in the incidence of cancer. Furthermore, these mice also showed a lower incidence of other age-related illnesses such as osteoporosis, greater glucose uptake or improvements in motor coordination. When the researchers carried out these same experiments with a variety of mice that produce more telomerase - a protein that lengthens telomeres and protects chromosomes - they observed that these mice not only enjoyed better health but also lived up to 20% longer. "We believe that such a significant increase in longevity is due to the protective effect against cancer produced by caloric restriction - incidences fall by 40% if we compare them with the mice that produce more telomerase and have a normal diet - and, added to the presence of longer telomeres, this makes the mice live longer and better." It is calculated that there are currently more than 10,000 people in the world on some form of controlled caloric restriction, so the observation of these individuals will be decisive in discovering the effects of this type of diet on humans. Do you ever feel like modern technology is speeding past you? You finally have the boxes that now sit where a VCR used to just about figured out, and suddenly it's all YouTube channels instead. A person has only so much attention per unit time to give the world, and the world is populous, filled by people intent on building new technologies, new choices, new ways of doing things. The scope of casual familiarity will ever shrink in comparison to the scope of the possible - and there's nothing wrong with that. It's a sign of progress. It's actually been some years since having a video distribution channel became de rigueur for any organization much past its first couple of months of life. From what I've seen of video-related entrepreneurial activities of late, you should expect the pervasiveness of video to greatly increase over the decade ahead: it's very effective for many uses, and it has become quite cheap to produce. That cost continues to fall. Some discussion of Alzheimer's disease starts in the middle around 38:04, under the heading "Is there such a thing as AD?" if you want to leap right in. Following on from yesterday's post on the pervasive acceptance of both aging to death and centralized control over society, here is another item that illustrates how state control of medical services and their funding via taxation distorts ethics in the matter of life and death. It quickly becomes acceptable to talk about structuring countless deaths to reduce costs - the power of perverse incentives at work. In industries not so dominated by the state, growth in customer needs and outlays is a boon, an opportunity for growth to meet the challenge, but where the state runs things it inevitably means rationing: the incentives operate to make us all worse off. We become inured to this, disturbingly. So you won't find much outrage in response to this sort of thing, and especially not the relevant sort of outrage - that this is what centralized control over medicine and health brings us to, a complete reversal of the eagerness to serve and develop new products that is the characteristic of a free market. Past successes in reducing smoking have paid off in slower spending growth on associated medical conditions. Has smoking reduction has also slowed the rate of growth in total health care spending? Maybe, but maybe not. [One] component of outlays declines over time due to a healthier population with lower per capita health care costs. However, another component labeled "Effects of greater longevity on outlays" increases over time as smoking-related deaths are averted and more individuals are alive to collect Social Security and consume federally funded health care. After about twelve years, the longevity effect begins to outweigh the per capita spending effect, and federal outlays are actually increased by the reduced prevalence of smoking brought about by the excise tax! Too bad that not smoking couldn't just keep us healthier without prolonging life! Without this dreaded longevity effect, we could unambiguously claim to be saving money in addition to producing greater health. Seriously though, the narrow question of whether reduced prevalence of smoking saves federal dollars hinges on the number of extended life years. Because some policy-makers will evaluate tobacco control programs on whether they save federal dollars, the delayed-mortality effect of reduced smoking is a negative from this perspective. This perverse result is no knock on the CBO study; it simply answers the question asked and is careful to note that "consequences for the federal budget are only one factor that lawmakers may consider when developing policies to promote health." We have previously shown that autophagy is required for chronological longevity in the budding yeast Saccharomyces cerevisiae. Here we examine the requirements for autophagy during extension of chronological life span (CLS) by calorie restriction (CR). We find that autophagy is upregulated by two CR interventions that extend CLS: water wash CR and low glucose CR. Autophagy is required for full extension of CLS during water wash CR under all growth conditions tested. In contrast, autophagy was not uniformly required for full extension of CLS during low glucose CR, depending on the atg allele and strain genetic background. Leucine status influenced CLS during CR. Eliminating the leucine requirement in yeast strains or adding supplemental leucine to growth media extended CLS during CR. In addition, we observed that both water wash and low glucose CR promote mitochondrial respiration proficiency during aging of autophagy-deficient yeast. In general, the extension of CLS by water wash or low glucose CR was inversely related to respiration deficiency in autophagy-deficient cells. Also, autophagy is required for full extension of CLS under non-CR conditions in buffered media, suggesting that extension of CLS during CR is not solely due to reduced medium acidity. Thus, our findings show that autophagy is: (1) induced by CR, (2) required for full extension of CLS by CR in most cases (depending on atg allele, strain, and leucine availability) and, (3) promotes mitochondrial respiration proficiency during aging under CR conditions. We live in an age in which the majority of people blithely accept the suffering and death of aging as a given, an axiom, something of no great consequence to the arrangement of everyday life, and do much the same for the centralized control over lives and activities undertaken by a small, empowered elite. The latter is not a novel situation - see ancient Sparta, for example - but the sheer, pervasive breadth and depth in which it is presently practiced is an invention of the past few hundred years, made possible through great increases in wealth and technology. The Panopticon state is a modern creation, Sparta only its tiniest seed. Aging is aging, of course, and has been with us since the beginning. But both of these things are far from inconsequential, and indeed they shape our lives to a very great degree. It is an important point that most people consider it unremarkable and entirely ethical to talk of regimenting society, placing widespread strictures on everyday activities and choices. Part of the struggle faced by researchers and advocates focused on lengthening human life stems from the fact that a large portion of the population sees nothing inherently wrong in forcing other people to act or not act as they see fit - or worse in forcing them to suffer and die to a timetable. It's somewhat irrelevant that the reasons for such would-be tyranny are flimsy and illogical. The real horror is that this is considered normal and reasonable. Prompting this line of thought, earlier today I stumbled over an unusual argument against working to reverse degenerative aging and extend healthy life. At root it appears to suggest that a higher throughput of human lives is better (for nebulous reasons relating to variety of life and culture at any given moment), and since population will tend to fall off with increasing wealth and longevity we should thus refrain from trying to prevent the tremendous suffering and death caused by aging. As I was thinking what to make of this particular example, it occurred to me that in order to put forward this sort of argument, you really have to be very accepting of the present cost of aging: the pain, the death, the loss. It has to be a trivial axiom, something that isn't all that important, if you can focus instead on incrementally steering the variety of culture present in the world. Further, you would also have to be pretty comfortable with the sort of tyranny needed to force the world to relinquish biotechnology and die to a particular arbitrary schedule. My most serious worry is about the lower total population of 90-150. 10 people wind up existing in 240 years, in contrast with 14 in 30-90. The reason this troubles me is not because I'm concerned about the four missing people. They are not harmed by not coming into existence. The reason why 30-90 seems better is because it has greater human richness. It's more diverse because four more people come into the world, and that diversity has advantages for the people who exist in that world. Greater human diversity goes along with more intellectual and technological progress, or so it's been hypothesized by [diverse] authors. They hypothesize that the huge current population of the world is one reason why we are at a point of unprecedented development in many areas. More people means more specialization, more minds working on problems. The crucial thing here is not just how many people exist at a time, but how many exist over time. Arguably, 30-90 is better than 90-150 for the reason that more people are around to contribute to the human enterprise in 30-90 (though the same number exist at one moment in time). It is an ongoing failure on our part that people can idly - or not so idly as has been the case in past years - make arguments of this nature without being noted as unethical, evil, and morally bankrupt. You can advocate enforcing the deaths of as many people as you like, and for whatever thin reasons, so long as they are old, or so it seems. Few people will think you any less of an upstanding fellow for doing so. If this is your first time visiting our site, welcome. If you've been here before, you're no doubt noticing plenty that is new: an updated site design, a variety of new content, a new logo, and a new organizational name. So we've consulted with a number of talented and insightful PR folks, and they all offered the same basic advice: "You do a great job of telling people what you do. Now tell them why they should care." That's really the root of the aforementioned changes: we want to do a better job of communicating that, together, we can change the way we think about how to treat age-related disease. We can change the basic research premises that have so far prevented any age-related disease from being eradicated. We can improve medicine in some of the most critical but neglected areas and increase human healthspan. It's quite a bit of change, but it all starts when enough of us reimagine aging. [Researchers] studied 1,984 older adults (average age about 77 years) enrolled in a prospective observational study that began in 1997-1998. A total of 1,162 individuals with baseline hearing loss had annual rates of decline in test scores that measured global and executive function that were 41 percent and 32 percent greater, respectively, than those among individuals with normal hearing. Compared to those individuals with normal hearing, individuals with hearing loss at baseline had a 24 percent increased risk for incident cognitive impairment, according to the study results. "Our results demonstrate that hearing loss is independently associated with accelerated cognitive decline and incident cognitive impairment in community-dwelling older adults," the authors comment. "The magnitude of these associations is clinically significant, with individuals having hearing loss demonstrating a 30 percent to 40 percent accelerated rate of cognitive decline and a 24 percent increased risk for incident cognitive impairment during a six-year period compared with individuals having normal hearing." Skin is an excellent candidate for the forefront of tissue engineering: producing tissue in thin sheets reduces the scope of many of the hurdles involved, such as blood vessel formation to support cells in the tissue interior, or the need for innovation in the growth environment and equipment used to host and encourage growing tissue. Nonetheless, it's still a work in progress. Skin is still a complicated item, for all that it might be simple in comparison to a lung or a kidney - getting the skin layers right, with the correct cell types doing the correct things in the correct places, is one challenge only recently solved, for example. That's not even to talk about the difficulties of adding hair to the mix. Leng's modest prototype looks like a small open box of clear hard rubber, the layered floor of which contains a delta of microfabricated pathways. These lead from seven reservoir stations to a single output stream. Just like the colour cartridges in my printer, Leng's reservoirs of live cells are computer controlled to dispense precise amounts exactly where needed. She switches on a variable pressure device that drives the material into a base stream of alginate - a medically approved derivative of algae. The cells that would be placed in the reservoirs to fabricate human tissue would ideally be drawn from the patient, but could also be compatible donor or stem cells. "The stream flows into a liquid-filled reservoir that contains calcium chloride," Leng says, as a milky-white ribbon appears in a tank at the output end. "The calcium ions bind to the alginate chain and cause it to become a gel." The ribbon of skin-like tissue winds around a small turning spindle or drum, the speed of which can determine the tissue's thickness and even its texture. More pull from the drum makes the material tougher, like muscle tissue. The drum could also be used to make a tissue cylinder - a vein. "Think of something like duct tape," says Guenther, who also directs the underground lab that bears his name. "You make the tissue adhesive on one side, it sticks to itself, and you create a physical tube." The alginate, which degrades over time, provides only a temporary matrix for the cells, Guenther says. The cells attach to each other, and replace the disintegrating matrix with their own. Guenther says the prototype printer cost a few hundred dollars to make. Apart from the micro-fabricated elements in the base, the whole thing looks like it could be assembled in a handyman's basement. One early version of the receiving chamber was a fish tank purchased in Chinatown. Guenther tells me, with amused pride, that it cost $20 - then shows me a pouch as big as his hand that contains a $4,000 sheet of dermal regeneration template - the stuff used in more laborious forms of tissue engineering. The living cells in the tissue printer were taken from neonatal rats. The first clinical trials will be undertaken with mice, then pigs. Another hurdle to be cleared is the matter of cell supply. Ideally, says Guenther, cells for a human recipient should be made from the patient's own tissue. How that or donated material could be harvested quickly enough to feed a high-capacity tissue printer still has to be worked out. Jeschke says he hopes that a trial with five to 10 human patients could be possible within two to three years. You might also look at an article from early last year on an automated artificial skin factory in Germany that produces small skin sections for research or grafting - an early model for what will come later when tissue engineering is more advanced. So How Do You Measure Life Span in Fly Studies? Individual aging is manifest at the population level as an increase in age-dependent mortality, which is often measured in the laboratory by observing lifespan in large cohorts of age-matched individuals. Experiments that seek to quantify the extent to which genetic or environmental manipulations impact lifespan in simple model organisms have been remarkably successful for understanding the aspects of aging that are conserved across taxa and for inspiring new strategies for extending lifespan and preventing age-associated disease in mammals. The vinegar fly, Drosophila melanogaster, is an attractive model organism for studying the mechanisms of aging due to its relatively short lifespan, convenient husbandry, and facile genetics. However, demographic measures of aging, including age-specific survival and mortality, are extraordinarily susceptible to even minor variations in experimental design and environment, and the maintenance of strict laboratory practices for the duration of aging experiments is required. These considerations, together with the need to practice careful control of genetic background, are essential for generating robust measurements. Indeed, there are many notable controversies surrounding inference from longevity experiments in yeast, worms, flies and mice that have been traced to environmental or genetic artifacts. In this protocol, we describe a set of procedures that have been optimized over many years of measuring longevity in Drosophila using laboratory vials. One probable factor involves chemical "tags" that attach to DNA sequences, part of a so-called epigenetic system that helps regulate when and how DNA sequences are "read," how they're used to create proteins and how they affect the onset or progress of disease. To complicate matters, [the] attachment of the tags to particular DNA sequences can itself be regulated by genes. "The details of what causes a particular sequence to be tagged are unclear, but it seems that some tagging events depend on certain DNA sequences. In other words, those tagging events are under genetic control." Other tagging events, however, seem to depend on cellular processes and environmental changes, some of which could be the result, rather than the cause, of disease. To tease apart these two types of tagging events, the researchers catalogued DNA sequences and their tagging patterns in the white blood cells of more than 300 people with and without one form of RA. The team then began filtering out the tags that did not appear to affect RA risk. For example, if tags were seen on the same DNA sequence in those with and without RA, it was assumed that the tags at those sites were irrelevant to the cause or development of the disease. Ultimately, the team identified 10 DNA sites that were tagged differently in RA patients and whose tagging seemed to affect risk for RA. Nine of the 10 sites were within a region of the genome known to play an important role in autoimmune diseases, while the 10th was on a gene that had never before been associated with the disease. "Since RA is a disease in which the body's immune system turns on itself, current treatments often involve suppressing the entire immune system, which can have serious side effects. The results of this study may allow clinicians to instead directly target the culpable genes and/or their tags." Visionary topics are of necessity long-term, hence high risk, and of almost equal necessity high gain. In the area of medical research, for example, the question must be raised: are we benefiting the most people, to the greatest extent, with the highest probability, by the current distribution of research funding? In all such areas that I can think of, the fundamental bias apparent in public opinion and public policy is in favour of approaches that might, arguably (often very arguably), deliver modest short-term benefits but which offer pretty much no prospect of leading to more effective, second-generation approaches down the road. The routes to those second-generation approaches that show the best chance of success are, by contrast, marginalised as a result of their lack of "intermediate results". We should be very, very worried about this. I would go so far as to say that it is already costing masses - masses - of lives, by slowing down life-saving research. And how hard is it to address, really? How hard is Bayes' Theorem, really? I would assert that the single most significant thing that those who understand the issue I have highlighted here can do to benefit humanity is to agitate for better understanding of probabilistic reasoning among policy-makers, opinion-formers and thence the public. Sarcopenia has been indicated as a reliable marker of frailty and poor prognosis among the oldest individuals. We evaluated the impact of sarcopenia on the risk of all-cause death in a population of frail older persons living in community. We analysed data from the Aging and Longevity Study, a prospective cohort study that collected data on all subjects aged 80 years and older residing in the Sirente geographic area (n = 364). The present analysis was conducted among those subjects who were between 80 and 85 years of age at the time of the baseline assessment (n = 197). The main outcome measure was all-cause mortality over 7-year follow-up. According to the European Working Group on Sarcopenia in Older People (EWGSOP) criteria, the diagnosis of sarcopenia required the documentation of low muscle mass and the documentation of either low muscle strength or low physical performance. [Using] the EWGSOP-suggested criteria, 43 subjects with sarcopenia (21.8%) were identified. During the 7-year follow-up, 29 (67.4%) participants died among subjects with sarcopenia compared with 63 subjects (41.2%) without sarcopenia. After adjusting for potential confounders including age, gender, education, activities of daily living (ADL) impairment, body mass index, hypertension, congestive heart failure, chronic obstructive pulmonary disease, number of diseases, TNF-α, participants with sarcopenia had a higher risk of death for all causes compared with non-sarcopenic subjects. Researchers have long known that the gene, p16INK4a (p16), plays a role in aging and cancer suppression by activating an important tumor defense mechanism called 'cellular senescence'. The [team] has developed a strain of mice that turns on a gene from fireflies when the normal p16 gene is activated. In cells undergoing senescence, the p16 gene is switched on, activating the firefly gene and causing the affected tissue to glow. Throughout the entire lifespan of these mice, the researchers followed p16 activation by simply tracking the brightness of each animal. They found that old mice are brighter than young mice, and that sites of cancer formation become extremely bright, allowing for the early identification of developing cancers. "With these mice, we can visualize in real-time the activation of cellular senescence, which prevents cancer but causes aging. We can literally see the earliest molecular stages of cancer and aging in living mice." Since we're on the subject of cryonics today, I thought I'd point you to a review of the Alcor-40 conference published in Alcor's house magazine. The conference was held a few months back; you might compare this review with another conference report that was published in October. In honor of its 40th anniversary, Alcor held its first conference in 5 years on October 19-21, 2012, in Scottsdale, Arizona. The program featured a wide variety of topics for presentation, with themes regarding how to improve the odds of a successful cryopreservation and theories of aging and their implications for stopping or reversing aging (as argued by their primary scientific proponents). The Chief Scientific Officer of 21st Century Medicine, Inc. (21CM), Greg Fahy, kicked off the event with an overview of the work being carried out at 21CM in his talk "Progress Toward Reversible Cryopreservation of Complex Systems." Because cryonics is reliant upon technologies that do not yet exist, it is sometimes likened to religion. "Unlike religion, cryonics must be based on evidence," Fahy began, emphasizing that reversibility is the key component of successful suspended animation. Fahy rounded things out with an update on 21CM's "20 year plan." Begun in 2010, their work in whole body vitrification has marched forward with the ultimate goal of reversibility by 2030. Precision perfusion control systems have allowed for unprecedented data collection during whole body vitrification experiments. Currently, the company is focusing on studies of cryoprotectant toxicity to make the next advance toward reversible cryoprotection of the most complex system of all, the whole organism. The cryonics movement is perhaps the oldest continuous portion of the modern community of advocates and supporters interested in radical life extension and the defeat of aging. This is a community distinguished from all those that came before it by the fact that is members are in a position to actually do something about the issues of death and aging. Technology is far enough along for people to work on preserving the minds of those who die too early, and we now have a shot at building working rejuvenation therapies over the next twenty to thirty years. All it needs is money. Present efforts are foundation work or crude first attempts in comparison to what lies ahead, but they exist, which is more than could be said just a few decades ago. Plastination seems to have the potential to become a viable alternative to cryonics as a long-term storage method for the brains of those who die before the advent of rejuvenation biotechnology. If the fine structure that encodes the data of the mind is preserved, then these individuals can wait indefinitely for the arrival of molecular nanotechnology needed to restore them to life. Cryonics has been around for decades, and has had its challenges, while plastination remains a comparatively new idea - and thus we should expect there to be hurdles to overcome. I have always been interested in chemical fixation as a (low cost) alternative for cryonics. In fact, years before all the talk about the "connectome" and "plastination" I spent considerable time exchanging messages with Michael Perry at Alcor about the technical and practical feasibility of chemical brain preservation. But no matter how open minded I tried to be about this approach, I kept running into the same challenges over and over again. The challenge that has concerned me the most is whether a delayed start of chemical brain fixation will produce incomplete distribution of the chemical fixative in the brain because of ischemia-induced perfusion impairment. Thinking about the technical problem of "no-reflow" is not the first thing on the mind of someone who first hears about the idea of using chemical fixatives to preserve the brain. In my case, this concern was not just "theoretical." In my lab I have spent many years looking at the effects of cerebral ischemia on cryopreservation and chemical fixation. Last year we decided to broaden our investigations to delayed chemical fixation and we have not been pleased at what we have observed so far. After 1.5 years of room temperature storage the delayed aldehyde fixed brains are falling apart and continue to decompose. In small animals one might imagine that such perfusion impairment could be overcome by immersing the brains in the fixative instead but human brains are simply too large. By the time that the fixative would have reached the core of the brain, extensive autolysis will have occurred. Aging is a process of gradual functional decline leading to death. Reactive oxygen species (ROS) contribute to oxidative stress and cell damage that lead to aging but also serve as signaling molecules. Sestrins are evolutionarily conserved in all multicellular organisms and are required for regenerating hyperoxidized forms of peroxiredoxins and ROS clearance. However, whether sestrins regulate longevity in metazoans is still unclear. Here, we demonstrated that SESN-1, the only sestrin ortholog in Caenorhabditis elegans, is a positive regulator of lifespan. sesn-1 gene mutant worms had significantly shorter lifespans compared to wild-type animals, and overexpression of sesn-1 prolonged lifespan. Moreover, sesn-1 was found to a play key role in defense against several life stressors, including heat, hydrogen peroxide and the heavy metal copper; and sesn-1 mutants expressed higher levels of ROS and showed a decline in body muscle function. [These] results suggest that SESN-1 is required for normal lifespan and its function in muscle cells prevents muscle degeneration over a lifetime. If you make it real hot, real fast, the frog will jump out of the pot. But if you turn up the heat slowly, before the frog realizes it, it will be too late, and the frog slowly dies. As aging humans, we are all slowly (and some not so slowly) being boiled alive by the ravages of time. The world's 1,226 billionaires, like that ill-fated frog in the story above, are [also] slowly being boiled alive. Why, then, aren't they, or at least several of them, stepping up to the plate and getting out of the slowly heating pot that will put an end to all that they now enjoy and have worked so successfully to achieve? After all, at least 215 of them have $5 billion or more, and we estimate we might solve aging for less than $5 billion total spread over the next 16-20 years. Some billionaires actually get it and in fact have offered some funding. But none has made a major commitment as far as I know. And that's tragic - for them and for you. [Researchers] identified a molecule that stimulates the activity of the brain's immune cells. The molecule, known as MPL (monophosphoryl lipid A), has been used extensively as a vaccine adjuvant [for] many years, and its safety is well established. The researchers see two potential uses for MPL. It could be administered by intramuscular injection to people with Alzheimer's disease to slow the progression of the illness. It could also be incorporated into a vaccine designed to stimulate the production of antibodies against amyloid beta. "The vaccine could be given to people who already have the disease to stimulate their natural immunity. It could also be administered as a preventive measure to people with risk factors for Alzheimer's disease." This result is reminiscent of the demonstration that ethanol produces significant life extension in nematodes - and similarly, one wonders whether it will be confirmed, and if so why it wasn't noted a long time ago. If it is accurate, it casts doubt on a range of life span studies that used the solvents in question. Lifespan extension through pharmacological intervention may provide valuable tools to understanding the mechanisms of aging and could uncover new therapeutic approaches for the treatment of age-related disease. Although the nematode C. elegans is well known as a particularly suitable model for genetic manipulations, it has been recently used in a number of pharmacological studies searching for compounds with anti-aging activity. These compound screens are regularly performed in amphipathic solvents like dimethyl sulfoxide (DMSO), the solvent of choice for high-throughput drug screening experiments performed throughout the world. In this work, we report that exposing C. elegans to DMSO in liquid extends lifespan up to 20%. Interestingly, another popular amphipathic solvent, dimethyl formamide (DMF), produces a robust 50% increase in lifespan. These compounds work through a mechanism independent of insulin-like signaling and dietary restriction (DR). Additionally, the mechanism does not involve an increased resistance to free radicals or heat shock suggesting that stress resistance does not play a major role in the lifespan extension elicited by these compounds. Interestingly, we found that DMSO and DMF are able to decrease the paralysis associated with amyloid-β(3-42) aggregation, suggesting a role of protein homeostasis for the mechanism elicited by these molecules to increase lifespan. The Russian end of the longevity science advocacy community seems to include a majority of its graphic design folk; certainly they've published a range of attractive, glossy materials in past years. Not that there's anything stopping the rest of us raiding 99 Designs or similar, other than the nagging feel that we should have donated those funds to the SENS Foundation to go towards research. But the point stands: it's not as though a lack of local design talent these days is any barrier to having professional quality work created at a good price. Via Maria Konovalenko, here are a couple more items to add to the stack - click through for the full size PDF versions. 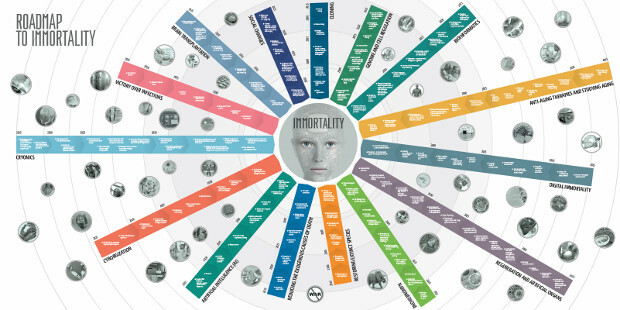 We have created the Roadmap to Immortality - a timeline of events that will lead to indefinite human lifespan extension. Some of these evens can happen simultaneously, some separately, some even already happened. People are always willing to argue over the role for referencing immortality, in the modern diluted sense of agelessness achieved through medical technology, in the course of advocacy for research funding and public awareness of longevity science. I think it has its place: if no-one is pushing out the bounds of what is accepted as reasonable in public discourse, then "reasonable" will forever be a rejection of any talk of improving human life span. Indeed, that is exactly where things stood in the scientific community only a decade or two ago, and largely because researchers remained silent. Only by talking about and working towards ambitious goals like SENS and the complete defeat of degenerative aging does the average position in public debate become something like "well, maybe we could work on extending human life." There is much work left to do, of course, and the path to moderation always sets in once real money arrives and people start to focus on achieving the next incremental advance - but it's still the case that you don't raise the average by cutting back the highest and most ambitious points. A common thread among conserved life span regulators lies within intertwined roles in metabolism and energy homeostasis. We show that heterozygous mutations of AMP biosynthetic enzymes extend Drosophila life span. The life span benefit of these mutations depends upon increased AMP:ATP and ADP:ATP ratios and adenosine monophosphate-activated protein kinase (AMPK). Transgenic expression of AMPK in adult fat body or adult muscle, key metabolic tissues, extended life span, while AMPK RNAi reduced life span. Supplementing adenine, a substrate for AMP biosynthesis, to the diet of long-lived AMP biosynthesis mutants reversed life span extension. Remarkably, this simple change in diet also blocked the prolongevity effects of dietary restriction. These data establish AMP biosynthesis, adenosine nucleotide ratios, and AMPK as determinants of adult life span; provide a mechanistic link between cellular anabolism and energy sensing pathways; and indicate that dietary adenine manipulations might alter metabolism to influence animal life span. Chronic treatment with β-adrenergic receptor (βAR) agonists increases mortality and morbidity while βAR antagonists (β-blockers) decrease all-cause mortality for those at risk of cardiac disease. Levels of sympathetic nervous system βAR agonists and βAR activity increase with age, and this increase may hasten the development of age-related mortality. Here, we show that β-blockers extend the life span of healthy metazoans. The β-blockers metoprolol and nebivolol, administered in food daily beginning at 12 months of age, significantly increase the mean and median life span of isocalorically fed, male C3B6F1 mice, by 10 and 6.4 %, respectively. Neither drug affected the weight or food intake of the mice, indicating that induced CR is not responsible for these effects, and that energy absorption and utilization are not altered by the drugs. Both β-blockers were investigated to control for their idiosyncratic, off-target effects. Metoprolol and nebivolol extended Drosophila life span, without affecting food intake or locomotion. Thus, βAR antagonists are capable of directly extending the life span of two widely divergent metazoans, suggesting that these effects are phylogenetically highly conserved. Thus, long-term use of β-blockers, which are generally well-tolerated, may enhance the longevity of healthy humans. A fair number of research groups work on calorie restriction these days - a considerably different state of affairs when compared to the paucity of such research two decades past. While the phenomenon of increased longevity with reduced calorie intake was first demonstrated in the laboratory in the 1930s, the present wave of funding and interest only gathered steam after the first simple genetic manipulations were shown to extend life in a range of species, leading the research community to accept the idea of manipulating metabolism to slow aging. That is something of an oversimplification, ignoring years of advocacy within and without the scientific community, and the way that falling costs in biotechnology make fields economically viable to explore, but you can't tell the complete story in every sitting. Sadly, for all that it took a great deal of time and work to get the research community to accept and openly talk about slowing aging as a goal, slowing aging is the wrong idea and the goal if fast results for increased human life span are your desired end result. You want to reverse aging by repairing the damage produced by its root cause mechanisms, not just slow it down by changing the pace at which those root causes operate. Slowing aging is most likely harder to achieve safely, and will be of little use to old people; no-one has a detailed plan that describes how to slow aging reliably. A detailed plan for how to reverse it does exist. There is thus yet another sweeping change of realization and strategy that must take hold in the aging and longevity science community before we can hope to see radical life extension in our lifetimes. Calorie restriction (CR), or a diet modification aiming to reduce the total intake of calories by 20%-40%, has been shown to increase longevity across multiple species. Recently, there has been growing interest in investigating the potential role of CR as a treatment intervention for age-related diseases, such as cancer, because an increasing body of literature has demonstrated a metabolic component to both carcinogenesis and tumor progression. In fact, many of the molecular pathways that are altered with CR are also known to be altered in cancer. Therefore, manipulation of these pathways using CR can render cancer cells, and most notably breast cancer cells, more susceptible to standard cytotoxic treatment with radiation and chemotherapy. In this review article we demonstrate the laboratory and clinical evidence that exists for CR and show compelling evidence through the molecular pathways CR induces about how it may be used as a treatment in tandem with radiation therapy to improve our rates of disease control. Calorie restriction extends longevity and delays ageing in model organisms and mammals, opposing the onset and progression of an array of age-related diseases. These beneficial effects also extend to the maintenance of brain cognitive functions at later age and to the prevention, at least in rodents, of brain senescence and associated neurodegenerative disorders. In recent years, the molecular mechanisms underlying brain response to calorie restriction have begun to be elucidated, revealing the unanticipated role of a number of key nutrient sensors and nutrient-triggered signaling cascades in the translation of metabolic cues into cellular and molecular events that ultimately lead to increased cell resistance to stress, enhanced synaptic plasticity, and improved cognitive performance. On a related note, calorie restriction improves the long-term health of the peripheral nervous system - just one of many components of the aging body that deteriorates more slowly and is better supported when you eat fewer calories while still obtaining suitable levels of micronutrients. The peripheral nervous system (PNS) comprises of an extensive network of connections that convey information between the central nervous system (CNS) and peripheral organs. Long myelinated nerve fibers are particularly susceptible to age-related changes, as maintenance of the insulating glial membrane requires extensive synthesis and processing of many proteins. In rodent models, peripheral demyelination caused by genetic risk factors or by normal aging are attenuated by intermittent fasting (IF) or calorie restriction (CR) supporting a role for dietary intervention in preserving neural function. It is generally appreciated that frogs and salamanders have remarkable regenerative capacities, in contrast to mammals, including humans. For example, if a tadpole loses its tail a new one will regenerate within a week. In an earlier study, [researchers] identified which genes were activated during tail regeneration. Unexpectedly, that study showed that several genes that are involved in metabolism are activated, in particular those that are linked to the production of reactive oxygen species (ROS) - chemically reactive molecules containing oxygen. [The researchers] were able to show that a marked increase in H2O2 occurs following tail amputation and interestingly, they showed that the H2O2 levels remained elevated during the entire tail regeneration process, which lasts several days. To assess how vital the presence of ROS are in the regeneration process, [the scientists] limited ROS production using two methods. The first was by using chemicals, including an antioxidant, and the second was by removing a gene responsible for ROS production. In both cases the regeneration process was inhibited and the tadpole tail did not grow back. "When we decreased ROS levels, tissue growth and regeneration failed to occur. Our research suggests that ROS are essential to initiate and sustain the regeneration response. We also found that ROS production is essential to activate Wnt signalling, which has been implicated in essentially every studied regeneration system, including those found in humans." A research paper here puts forward an estimate for the cost of treating dementia - though the true economic burden must also consider opportunity costs: what might have been accomplished by patients had they not become disabled. Dementia is but one of the many degenerative conditions of aging, of course, and all of the others have their costs as well. The overall cost of aging is staggering, and, sadly, rarely considered. If it was, we might see more effort put towards developing the means to repair and reverse the causes of aging. The basic design of this study was a societal, prevalence-based, gross cost-of-illness study in which costs were aggregated to World Health Organization regions and World Bank income groupings. The total estimated worldwide costs of dementia were US$604 billion in 2010. About 70% of the costs occurred in western Europe and North America. In such high-income regions, costs of informal care and the direct costs of social care contribute similar proportions of total costs, whereas the direct medical costs were much lower. In low- and middle-income countries, informal care accounts for the majority of total costs; direct social care costs are negligible. Worldwide costs of dementia are enormous and distributed inequitably. There is considerable potential for cost increases in coming years as the diagnosis and treatment gap is reduced. There is also likely to be a trend in low- and middle-income countries for social care costs to shift from the informal to the formal sector, with important implications for future aggregated costs and the financing of long-term care. Only by investing now in research and the development of cost-effective approaches to early diagnosis and care can future societal costs be anticipated and managed. Dr Shchepinov's theory is based on deuterium, a naturally-occurring isotope, or form of hydrogen, that strengthens the bonds in between and around the body's cells, making them less vulnerable to attack. He found that water enriched with deuterium, which is twice as heavy as normal hydrogen, extends the lifespan of worms by 10 per cent. And fruitflies fed the 'water of life' lived up to 30 per cent longer. We have investigated the effects of brief, non-specific deuteration of Drosophila melanogaster by including varying percentages of 2H (D) in the H2O used in the food mix consumed during initial development. Up to 22.5% D2O in H2O was administered, with the result that a low percentage of D2O in the water increased mean lifespan, while the highest percentage used (22.5%) reduced lifespan. After the one-time treatment period, adult flies were maintained ad libitum with food of normal isotopic distribution. At low deuterium levels, where lifespan extension was observed, there was no observed change in fecundity. Dead flies were assayed for deuterium incorporation ... Isoleucine and leucine residues showed a small, linear dose-dependent incorporation of deuterium at non-exchangeable sites. Although high levels of D2O itself are toxic for other reasons, higher levels of deuterium incorporation, which can be achieved without toxicity by strategies that avoid direct use of D2O, are clearly worth exploring. Well, either way, we shall hear more in future years. As the researchers point out above, you can conduct similar studies without the need for heavy water, and those should produce a more useful set of data. Exercise correlates with all sorts of better measures of health, but there is some debate and conflicting evidence on whether more is better past the point of moderate regular exercise. This ties in to questions of causation - to what degree are endurance athletes drawn to their activities because they are already more robust than their peers, for example? Telomeres are the molecular caps on chromosomes. They shorten with each successive cell division and are thus linked to aging. The shortening rate also varies among people. Shorter telomeres have been linked to increased disease risk as well as shortening of lifespan. Chronic endurance training is at least modestly linked with long lifespan, though there are some controversies about whether it may increase the risk of some heart diseases. In the current study researchers sought to determine if chronic endurance training is associated with telomere length in older aged individuals. To perform the trial they measured the length of telomeres in four groups of individuals: young people and older people who did or did non engage in chronic endurance training. For the endurance training the researchers chose participation in a 58 km cross country ski competition. They found that indeed the older people who were chronic endurance trainers had significantly longer telomeres than moderately active older controls. There was no difference in telomere length in the younger subjects whether they did endurance training or not. There was also an association in older people between VO2 max and telomere length. Over at In Search of Enlightenment you'll find an unpublished interview where the questions somewhat illustrate the point that most people don't look much beyond trivial matters when it comes to aging and longevity. Biotechnology like SENS and similar research projects are given no thought at all in most quarters, and even amongst advocates many favor the snail's pace path of trying to slow aging rather than working to repair its root causes to reverse it. This all means that there is much yet to accomplish in advocacy and education. The field of research known as biogerontology, which studies the biology of aging, is a truly fascinating, though often misunderstood, area of scientific research. In 2011 the genome of the naked-mole rat was sequenced. This rodent is only the size of a mouse, and one might wonder what the significance of sequencing its genome could possibly be. But the naked-mole rate is the longest living rodent, it has a maximum lifespan exceeding 30 years and an exceptional resistance to cancer. Understanding the biology of this species could help unlock the mystery of healthy aging. A variety of experiments on fruit flies, mice and other species have demonstrated that the rate of aging can be manipulated, either by calorie restriction or by activating particular genes. Such research could eventually lead to the development of a drug that safely mimics the effects of caloric restriction (which delays the onset of disease) or actives the "longevity genes" that help protect against the diseases of late life. The lion's share of funding for medical research is spent on disease research, such as research on cancer, heart disease or Alzheimer's disease. This approach, which I call "negative biology", assumes that the most important question to answer is "what causes disease?". Unfortunately this is a severely limited approach, especially for older populations. Even if you cured all 200+ forms of cancer (and we have not yet eliminated even just one cancer despite investing enormous sums of money for decades now), one of the other diseases of aging would quickly replace cancer as the leading cause of death because most people in late life are vulnerable to multiple diseases. So "positive biology" takes a different intellectual starting point. It assumes that the puzzles of exemplar health are just as important to understand as the development of disease. How can some (very rare) humans live over a century of disease-free life? Understanding these exemplar examples of health might prove to be more significant than trying to understand, treat and cure every specific disease of late life. Regenerative medicine is not an all or nothing field of research. There are many useful waypoints on the road to being able to grow perfectly formed organs, blood vessels, muscle, and other tissues to order and from a patient's own cells. The partial results and half-way houses include a range of potential therapies and technologies that will be a great improvement over the present clinical state of the art. Gain knowledge of the underlying mechanisms: cell signaling, stem cell life cycles, and so forth. Use this new knowledge to better understand the workings of existing therapies, and perhaps optimize them a little. Produce new tools for diagnosis and testing procedures based on what is now known. Develop a helpful therapy that meets some fraction of the end goal: healing damage in an organ rather than growing a new organ; growing cells to populate a bioartificial system that carries out some of an organ's function, for use in dialysis for example; and so forth. Build poor versions of the end goal and find uses for them. The ability to grow small masses of tissue that can carry out some of the functions of a liver or a kidney may be very helpful as implants for those suffering organ failure, for example. Finally, the end goal: organs grown from a patient's cells that are good enough for transplant. Below is an example of one type of waypoint in tissue engineering that is presently under widespread development: the use of cell transplants to spur regeneration and regrowth that would otherwise not have happened. This is a logical application of some of the knowledge gained regarding organ formation and growth; which cells are important, how they work together, and how they signal one another. [Scientists] have for the first time demonstrated that baboon embryonic stem cells can be programmed to completely restore a severely damaged artery. These early results show promise for eventually developing stem cell therapies to restore human tissues or organs damaged by age or disease. Mutations in genes involved in the electron transport chain that cause mitochondrial dysfunction can sometimes paradoxically lead to improved health and/or enhanced longevity. One example is the situation in mice with conditional knockout of the mitochondrial transcription factor A (TFAM) specifically in fat. These F-TFKO mice exhibit mitochondrial dysfunction with increased energy expenditure, but are protected from age- and diet-induced obesity, insulin resistance and hepatosteatosis, despite increased food intake. Mitochondrial DNA (mtDNA) is maternally inherited with multiple copies in each mitochondria. TFAM plays a critical role in maintenance and expression of mtDNA, and reductions of mtDNA copy number usually correlate with reduction of mitochondria content and function. So, how does a reduction in TFAM in fat have this beneficial effect? Upon high fat diet, [the F-TFKO] mice develop a build-up of long chain acyl carnitines in both adipose tissue and the circulation. In addition, markers of oxidative stress are observed at the level of DNA and lipids in adipose tissue of F-TFKO mice on high fat diet, indicating overload of the ROS protection system. Despite this mitochondria stress, the mice remain lean and insulin sensitive even at 10 months of age. Although no formal aging studies have been conducted in these mice, we also noted that by 18 months of age, an age at which the control mice have started to die, the F-TFKO mice are still thriving, suggesting this knockout may be beneficial to aging mice as well. Hair cell loss results from a variety of factors including noise exposure, aging, toxins, infections, and certain antibiotics and anti-cancer drugs. Although hearing aids and cochlear implants can ameliorate the symptoms somewhat, there are no known treatments to restore hearing, because auditory hair cells in mammals, unlike those in birds or fish, do not regenerate once lost. [Here, researchers] demonstrate for the first time that hair cells can be regenerated in an adult mammalian ear by using a drug to stimulate resident cells to become new hair cells, resulting in partial recovery of hearing in mouse ears damaged by noise trauma. This finding holds great potential for future therapeutic application that may someday reverse deafness in humans. The drug had been selected for its ability to generate hair cells when added to stem cells isolated from the ear. It acted by inhibiting an enzyme called gamma-secretase that activates a number of cellular pathways. The drug applied to the cochlea inhibited a signal generated by a protein called Notch on the surface of cells that surround hair cells. These supporting cells turned into new hair cells upon treatment with the drug. Replacing hair cells improved hearing in the mice, and the improved hearing could be traced to the areas in which supporting cells had become new hair cells. Members of the insurance industry tend to be more interested in aging research than the average individual. A great deal of money rests on accurate actuarial projections, and this is an age in which certainty in medical progress hard to come by. Biotechnology is moving very rapidly, which means game-changing advances in extending human life may or may not emerge depending on happenstance, politics, and accidents of fundraising. A great leap in applied longevity science lies somewhere ahead, the time until it arrives dependent on how fast the Strategies for Engineered Negligible Senescence can become a dominant research paradigm. Insurers are at the mercy of this great and coming storm, and the larger entities that get it wrong - by failing to prepare well or by betting against very large increases in life expectancy - will lose billions. So insurance conferences sometimes see appearances by biogerontologists, industry publications contain articles on the future of medical science, and actuaries spend a great deal of time and effort on evaluating research progress. In past years, I've seen a fair amount of interesting commentary from these sources. The engineering solutions that [Aubrey de Grey suggests as a part of the SENS vision] require futuristic technology and even tinkering with the human genome - for example, moving mitochondrial DNA into the cell nucleus to give it the greater protection afforded by the nucleus against mutations. These approaches ignore the morality and ethics of trying to extend human life by manipulating our cell biology. They also ignore the effects of natural selection. Although nature is not perfect, it is often the case that certain mechanisms such as cell senescence protect us from other diseases such as cancer, because if cells are allowed to survive forever they accumulate errors of duplication and mutations that sometime allow them to reproduce rapidly in an uncontrolled fashion. I think that we should instead focus on nurturing the health of mothers and young children, thereby maximising the store of redundancy that we are endowed with rather than attempting to fix things at the end of life. So, I do not think that we will live forever and I think that we should be very wary of well-meaning attempts to fix something that may not be broken. Which begs the question of what the author thinks modern medicine actually is, if it is not the manipulation of our cell biology so as to extend life. In what way does that description not cover near every form of drug or presently mainstream research aimed at treating fatal medical conditions? Medicine is exactly the quest to remain alive and comfortable in the face of natural adversity, and is conducted by changing the human condition, the surrounding environment, and yes, the body itself. I am sometimes given to believe that there is something about aging and longevity that clouds the mind and stops people from thinking clearly, in that what they say could quite easily be turned into objections to all modern medicine - and yet they are enthusiastically in favor of modern medicine. Just not for old people. It's somewhere between incredible, disturbing, and morally bankrupt. Worse is that you get used to seeing it over and again, the ease with which people advocate allowing widespread suffering and half a billion painful, horrible deaths every decade to continue unchanged, just because those who are dying now are old. Are we civilized? I wonder. Seems a mighty thin veneer some days. As to the rest of it, well, I'm sure you've seen the like. The standard objections, some faulty science thrown around to raise bogus risks, and the somewhat insulting assumption that these and an exhaustive list of other possible challenges have not already been thought about, debated, published in many papers and position statements, and otherwise worked on over the past decades. Lactobacilli and bifidobacteria are probiotic bacteria that modify host defense systems and have the ability to extend the lifespan of the nematode Caenorhabditis elegans. Here, we attempted to elucidate the mechanism by which bifidobacteria prolong the lifespan of C. elegans. When the nematode was fed Bifidobacterium infantis (BI) mixed at various ratios with the standard food bacterium Escherichia coli strain OP50 (OP), the mean lifespan of worms was extended in a dose-dependent manner. Worms fed BI displayed higher locomotion and produced more offspring than control worms. The growth curves of nematodes were similar regardless of the amount of BI mixed with OP, suggesting that BI did not induce prolongevity effects through caloric restriction. Notably, feeding worms the cell wall fraction of BI alone was sufficient to promote prolongevity. The accumulation of protein carbonyls and lipofuscin, a biochemical marker of aging, was also lower in worms fed BI; however, the worms displayed similar susceptibility to heat, hydrogen peroxide, and paraquat, an inducer of free radicals, as the control worms. As a result of BI feeding, loss-of-function mutants of daf-16, jnk-1, aak-2, tol-1, and tir-1 exhibited a longer lifespan than OP-fed control worms, but BI failed to extend the lifespan of pmk-1, skn-1, and vhp-1 mutants. As skn-1 induces phase 2 detoxification enzymes, our findings suggest that cell wall components of bifidobacteria increase the average lifespan of C. elegans via activation of skn-1, regulated by the p38 MAPK pathway, but not by general activation of the host defense system via DAF-16. The traditional root canal procedure involves removing decayed root tissue, or dental pulp, from the tooth's canal and filling that space with gutta percha, an artificial rubber-like substance. With Huang's new approach, the canals that have been cleared would be injected with stem cell tissue to stimulate healthy tissue growth, essentially rebuilding the tooth, and eliminating the need for gutta percha. "Our group has been able to demonstrate that we can isolate stem cells from the pulp tissue, let them expand or grow in culture dishes, seed them onto artificial or natural scaffolding materials, and then insert them into the canal space. Using a small animal model, we were able to demonstrate that we can entirely regenerate pulp tissue in the empty canal space." "The dentin can also be regenerated. The natural function of the pulp tissue is to maintain the homeostasis of the tooth and lay down the dentin structure to sustain the architecture of the tooth." Similar research in other countries has been successful. Testing has now moved to larger animals, including pigs and dogs, and clinical trials on humans could begin in the next 10 years. The American Aging Association is a non-profit group of experts dedicated to increasing functional life span through research, education, and advocacy in the field of biomedical gerontology. The American Aging Association was launched at a special luncheon meeting at the Waldorf-Astoria in New York City, October 19, 1970. Organized by a group of distinguished medical doctors and scientists who wanted a specific organization dedicated to aging research. Several state chapters were affiliated with the Association in the early years to draw attention to the public for the necessity for support of programs to eliminate aging. The formation of the Association also led to the development of affiliated groups, the International Association of Biomedical Gerontology in 1985 and the American College of Clinical Gerontology in 1986. This year's conference is scheduled for May 31st to June 3rd in Baltimore. This year we highlight the work of international experts in the molecular and cellular biology of aging, physiology and genetics of aging, experimental technology development, and healthcare policy. With these topics we focus on the interventions that the convergence of results from model systems indicate are possible for slowing and even reversing degenerative processes. The American Aging Association is not a wealthy organization; a research trust fund was established more than two decades ago, but has not grown large enough to distribute more than a few thousand dollars a year to research goals in aging science. It is worth remembering that advocates for longevity science faced an unrelenting uphill struggle prior to the last decade, far worse than the hard work it is today: a research community unwilling to speak out on the topic, a disinterested public, and little animal research that demonstrated ways and means to notably enhance longevity. AGE is a quarterly, international, peer-reviewed journal that publishes articles related to research in the biology of aging and research on biomedical applications that impact aging. On January 5, the second general meeting of the leaders and activists of the International Longevity Alliance (ILA) took place. [The] meeting took place in an extremely cooperative and constructive atmosphere. About 18 collaborative projects were initiated right there and then. The exact organizational structure, goals and ways to join the projects will be elaborated and announced soon, in the "Projects" section of the ILA website. To facilitate the collection of knowledge, exchange and distribution of free and accessible information about longevity, a Wikipedia project was initiated. A related item is the Collaborative Knowledge Management project that will provide a repository of information on aging and longevity researchers and research centers, as well as providing linking tools. And yet another form of knowledge collection and sharing will be the creation of Educational Platforms on longevity, for different audiences, lay and more academic. There is an overarching "Linking Researchers" project, initiated to facilitate the interaction with and between researchers in the field. [The] Denigma project will be the main IT platform in the creation of the repository of information on research of aging, and linking of researchers. The researchers worked with mice that are blind due to complete loss of the light-sensing photoreceptor cells in their retinas. This is the most relevant mouse model for treating patients who are blind from retinitis pigmentosa. After two weeks, the researchers showed the cells transplanted into the eye had re-formed a full light-detecting layer on the retina and the mice could see. The cells used were mouse 'precursor' cells that are on an initial path towards developing into retinal cells. "We found that if enough cells are transplanted together, they not only become light sensing but they also regenerate the connections required for meaningful vision. Stem cells have been trialled in patients to replace the pigmented lining of the retina, but this new research shows that the light-sensing layer might also be replaced in a similar way. The light-sensing cells have a highly complex structure and we observed that they can resume function as a layer and restore connections after transplantation into the completely blind retina." The researchers found [a] 6 percent lower risk of death for overweight; a 18 percent higher risk of death for obesity (all grades); a 5 percent lower risk of death for grade 1 obesity; and a 29 percent increased risk of death for grades 2 and 3 obesity. The authors note that the finding that grade 1 obesity was not associated with higher mortality suggests that that the excess mortality in obesity may predominantly be due to elevated mortality at higher BMI levels. How can this be? Is fat good for you? That's the wrong conclusion, according to epidemiologists. They insist that, in general, excess weight is dangerous. But then they have to explain why the mortality-to-weight correlation runs the wrong way. The result is a messy, collective scramble for excuses and explanations that can make the new data fit the old ideas. My suspicion: most of the remaining problems that chemical drugs haven't cured or slowed down are problems that chemical drugs can't fix. For most of what goes wrong as we age we need gene therapies, cell therapies, and other techniques that are powerful enough to repair or replace aged tissue. Chemical drugs are just too simple in structure and in potential effects. They can't do much tissue repair. The slow rate of cancer drug testing and the regulatory environment that causes the snail's pace is tragic. [If] I was dying of cancer and had months to live I'd volunteer to take a large dose of an experimental drug to find out its toxicity. If I was really lucky I'd be cured. If I was only moderately lucky the drug would kill me quickly so I wouldn't have to spend months in pain slowly dying. I bet if dying cancer patients were given the choice of whether to risk a fast death due to aggressive testing of new drugs enough would say yes that drug testing could be sped up substantially. Research into genetic contributions to longevity rolls onwards. APOE remains one of the few genes with variants associated with longevity in many populations. For the rest, it is expected that there are many different contributing variations, different by population, and each only causing a small change in life expectancy. It is still the case that genes are not as important as good lifestyle choices, and neither of those are anywhere near as important as progress in medical technology when it comes to the prospects for living a long life. Clear evidence exists for heritability of human longevity, and much interest is focused on identifying genes associated with longer lives. To identify such longevity alleles, we performed the largest genome-wide linkage scan thus far reported. Linkage analyses included 2118 nonagenarian Caucasian sibling pairs that have been enrolled in fifteen study centers of eleven European countries as part of the Genetics of Healthy Ageing (GEHA) project. In the joint linkage analyses we observed four regions that show linkage with longevity; chromosome 14q11.2, chromosome 17q12-q22, chromosome 19p13.3-p13.11 and chromosome 19q13.11-q13.32. To fine map these regions linked to longevity, we performed association analysis using [genome-wide association study] data in a subgroup of 1,228 unrelated nonagenarian and 1,907 geographically matched controls. [By] combined modeling of linkage and association we showed that association of longevity with APOEε4 and APOEε2 alleles explain the linkage at 19q13.11-q13.32. In the largest linkage scan thus far performed for human familial longevity, we confirm that the APOE locus is a longevity gene and that additional longevity loci may be identified at 14q11.2, 17q12-q22 and 19p13.3-p13.11. Since the latter linkage results are not explained by common variants, we suggest that rare variants play an important role in human familial longevity. I'd wager that the future of cell therapy probably won't involve much in the way of cell transplants, not even those created from the patient's own tissues. Instead it will be based on instructing existing cell populations in the body to take specific actions - progress here will proceed at a pace determined by how well researchers can catalog and understand the enormously complex networks of cell signaling that exists in every tissue type. Even though there is a long way to go yet in creating that catalog, a range of possible therapies are already under investigation based on what is presently understood of controlling cell behavior. There is certainly no shortage of methods for changing the cell and its environment - only a shortage in knowing which of the million levers to pull and dials to set in order to achieve the desired result with minimal side-effects. Consider that a cell is a collection of machines built out of proteins, and the controlling mechanisms are driven by the presence and levels of yet more proteins: any technique that manipulates the level of a certain protein can be used to potentially good effect. So there is plain old gene therapy to make cells produce more of a protein encoded by a specific gene. There is RNA interference to block a specific protein. There are all sorts of other ways to tinker with how much of a specific protein is produced from the blueprint of a specific gene at a given time: gene expression is a process of many intricate stages, and the research community can presently accurately target most of them, provided the time is put in. So all this said, we see technology demonstrations like the one noted below: no transplants, just instructing cells to do something different. There will be a lot more of this sort of thing going on in the years ahead. A variant of a gene associated with active personality traits in humans seems to also be involved with living a longer life. [This] derivative of a dopamine-receptor gene - called the DRD4 7R allele - appears in significantly higher rates in people more than 90 years old and is linked to lifespan increases in mouse studies. People who carry this variant gene [seem] to be more motivated to pursue social, intellectual and physical activities. The variant is also linked to attention-deficit/hyperactivity disorder and addictive and risky behaviors. "While the genetic variant may not directly influence longevity, it is associated with personality traits that have been shown to be important for living a longer, healthier life. It's been well documented that the more you're involved with social and physical activities, the more likely you'll live longer. It could be as simple as that." Ectopic expression of uncoupling protein 1 (UCP1) in skeletal muscle (SM) mitochondria considerably increases lifespan in high fat diet fed UCP1 transgenic (TG) mice in comparison to wildtype (WT). In order to clarify the underlying mechanisms we investigated substrate metabolism as well as oxidative stress damage and antioxidant defense in SM of low fat and high fat fed mice. TG mice [showed] elevated lipid peroxidative protein modifications with no changes in glycoxidation or direct protein oxidation. This was paralleled by an induction of catalase and superoxide dismutase activity, an increased redox signaling (MAPK signaling pathway), and increased expression of stress protective heat shock protein 25. We conclude that increased skeletal muscle mitochondrial uncoupling in vivo does not reduce the oxidative stress status in the muscle cell. Moreover it increases lipid metabolism and reactive lipid-derived carbonyls. This stress induction in turn increases the endogenous antioxidant defense system and redox signaling. All together our data argue for an adaptive role of reactive species as essential signaling molecules for health and longevity. When a molecule called TFP5 is injected into mice with disease that is the equivalent of human Alzheimer's, symptoms are reversed and memory is restored - without obvious toxic side effects. "We hope that clinical trial studies in AD patients should yield an extended and a better quality of life as observed in mice upon TFP5 treatment. Therefore, we suggest that TFP5 should be an effective therapeutic compound." To make this discovery, [researchers] used mice with a disease considered the equivalent of Alzheimer's. One set of these mice were injected with the small molecule TFP5, while the other was injected with saline as placebo. The mice, after a series of intraperitoneal injections of TFP5, displayed a substantial reduction in the various disease symptoms along with restoration of memory loss. In addition, the mice receiving TFP5 injections experienced no weight loss, neurological stress (anxiety) or signs of toxicity. The disease in the placebo mice, however, progressed normally as expected. TFP5 was derived from the regulator of a key brain enzyme, called Cdk5. The over activation of Cdk5 is implicated in the formation of plaques and tangles, the major hallmark of Alzheimer's disease. There are many candidates for ageless organisms, such as the hydra or the lobster, and some that have been revealed to in fact age in recent years as research costs fall far enough to allow these niche questions to be answered. Bacteria, for example, do age, but that was only conclusively established comparatively recently. Aging is not a large field in comparison to the life science mainstream, which is one of the reasons why there are so many unanswered questions relating to aging in various species. Here is a fairly typical example - a collection of lower species that may or may not age, probably does so in a very different way to higher organisms, and where the process is largely unstudied. Pale green and vaguely ruffled, like calcified doilies, lichens grow all over the tombstones and the old stone walls that fringe properties in this part of the world. Most people barely notice them. But Dr. Pringle, a mycologist at Harvard, believes they may help answer one of science's greatest questions: Is immortality biologically possible? For eight years, Dr. Pringle, 42, has been returning to this cemetery each fall, to measure, sketch and scrutinize the lichens, which belong to the genus Xanthoparmelia. She wants to know whether they deteriorate with the passage of time, leaving them more susceptible to death. Lichens are not individuals but tiny ecosystems, composed of one main fungus, a group of algae and an assortment of smaller fungi and bacteria. [While] lichens are communities, Dr. Pringle is largely interested in the fungi. Mycologists, the scientists who study fungi - not the most glamorous corridor of biology - have long assumed that many of these organisms don't age.The clear exception is yeast, a single-cell fungus that does senesce and that researchers use as a model to study aging. But most multicellular fungi, the assumption goes, don't senesce. No one has ever proved that, though, or even collected much data. The thesis in a post from last month at Overcoming Bias is that futurists, at least those with the vision to see the golden future ahead better than most folk, don't really do that much more to live longer. A significant share of the broader 'singularitarian' community believes that they have a chance to live for hundreds of years, if they can survive until the arrival of an AI singularity, whole brain emulation, or just the point at which medical technology is advancing fast enough to keep extending our health-span by at least a year each year (meaning we hit 'escape velocity' and can live indefinitely). Some are sufficiently hopeful about this to have invested in cryonics plans, hoping to be revived in the future, including Robin Hanson. Many others plan to do this, or think they should. But there are much more mundane ways of increasing the chance of making it to this glorious future: exercise regularly, eat a nutritious diet low in refined carbohydrates, don't smoke or hang around those who do, drink in moderation, avoid some illegal drugs, develop strong social supports to lower suicide and other mental health threats, have a secure high-status job, don't live in an urban area, don't ride a motorbike, get married (probably), and so on. While the futurist community isn't full of seriously unhealthy or reckless people, nor does it seem much better in these regards than non-futurists with the same education and social class. A minority enjoy nutritional number crunching, but I haven't observed diets being much better overall. None of the other behaviours are noticeably better. Which sounds about right from what I've seen. Do people, even those with vision, really care all that much about living longer? Sometimes it looks like the answer is, on average, not so much. At least not enough to make immediate sacrifices in money and time or hard left turns in the course of life. [JOL Press]: You are often described as "the man who tries to make us immortal." Immortality, do you believe? [Aubrey de Grey]: I do not agree with this presentation of my research. Sensationalism and this annoys me a lot because it undermines our credibility and affects, therefore, the money we can raise for [the research that] we finance. [JOL Press]: In this case, how would you describe your work? [Aubrey de Grey]: SENS is an association with a research center in California. We drive medical research whose goal is to prevent people from getting sick. One of our projects which we hope to make public soon, revolutionary advances, is to insert a gene [derived from bacteria] in our patients and prevent them from dying from cardiovascular disease - the No. 1 cause of death today. [JOL Press]: You say "soon", you hope when? [Aubrey de Grey]: In time ... there are different approaches to deal with - and destroy - the effects of aging on an individual and we are progressing slowly. We are continuing our experiments. If all goes as we hope, we expect significant gains in the rats of 8 to 10 years, then apply to humans in 20 or 40 years. [JOL Press]: Specifically, what do you mean by "treating aging"? [Aubrey de Grey]: Humans can live healthier, longer. Our approach is to transform the aging process. [JOL Press]: How do you get there? [Aubrey de Grey]: Regenerative medicine aims to repair the effects of damage, to prevent their recurrence. Our goal is to reverse the process, rather than just stop it or slow it down. Severe mitochondria deficiency leads to a number of devastating degenerative disorders, yet, mild mitochondrial dysfunction in different species, including the nematode Caenorhabditis elegans, can have pro-longevity effects. This apparent paradox indicates that cellular adaptation to partial mitochondrial stress can induce beneficial responses, but how this is achieved is largely unknown. Complete absence of frataxin, the mitochondrial protein defective in patients with Friedreich ataxia, is lethal in C. elegans, while its partial deficiency extends animal lifespan in a p53 dependent manner. In this paper we provide further insight into frataxin control of C. elegans longevity by showing that a substantial reduction of frataxin protein expression is required to extend lifespan, affect sensory neurons functionality, remodel lipid metabolism and trigger autophagy. We find that Beclin and p53 genes are required to induce autophagy and concurrently reduce lipid storages and extend animal lifespan in response to frataxin suppression. Reciprocally, frataxin expression modulates autophagy in the absence of p53. Human Friedreich ataxia-derived lymphoblasts also display increased autophagy, indicating an evolutionarily conserved response to reduced frataxin expression. In sum, we demonstrate a causal connection between induction of autophagy and lifespan extension following reduced frataxin expression. Based on the assumption that cultural and literary criticism can and should impact scientific and medical research on aging, this paper asks whether the analysis of a text such as the Super Sad True Love Story that has received very broad recognition can be seen as a cultural critical intervention into the ageism so often openly displayed in scientific discourses. Apart from more general social criticism, the novel includes numerous references to biogerontology and nanomedicine that - although at times sounding futuristic and satirical - represent up to date research results of modern life science laboratories. As a matter of fact, Shteyngart indicates in the afterword that he modeled the indefinite lifespan extension company on the work of biogerontologist Aubrey de Grey. Although de Grey, whose radical ideas have provoked harsh opposition in the scientific community, was first seen as an outsider, he has now come to occupy a central position in the field of anti-aging studies. Despite the fact that at the first glance his theories seem very bold and futuristic, he is "a factor to be dealt with in any serious discussion of the topic." In the end, Shteyngart maintains that "nature simply would not yield" (2010: 329) and biogerontology is seen as a major failure. Shteyngart here makes a provocative prediction regarding the future development of Aubrey de Grey's SENS project that serves as the scientific background of the novel, but does the novel's dystopic account of rejuvenation technology have the power to change its readers' ways of thinking regarding biogerontological research and the cultural meaning of old age? The Super Sad True Love Story mirrors and creatively distorts biogerontological discourses and thus provides a very good basis for comparison and discussion. Even if you do a good job as the author of a Frankenstein work, getting the groundwork right on the science involved, it's still a Frankenstein work. Science failing man - man attempting new science and having it fail or get beyond him in some plot-vital way - is ever a popular vision, but it is fundamentally unrealistic. We are where we are because our ancestors succeeded in science, continually, over and again. They incrementally created a better world with science, one step at a time, until the dreams, wonders, and visions of yesteryear now walk in everyday life. Novels that postulate gloom, failure, and malaise to result from human life extension are a dime a dozen. They far outnumber those that do not; indeed most of the positive visions are in those fictional settings in which great longevity simply exists, and is not really remarked upon, nor a part of the core plot. Consider the Culture, the Wheel of Time series, and so forth. Drag medicine and human longevity into the core plot, and suddenly the author is compelled to reweave Frankenstein out of the threads of biogerontology. It's a sad thing. There are sound reasons for all this, of course. Dystopian visions, tales of hubris and the resulting fall sell books, much as bad news sells newspapers. But that this all exists in the industry of fiction does not make it in any way useful or valid beyond entertainment - or, sadly, beyond propaganda, intentional or otherwise. The logic of writing a dystopian story or a Frankenstein tale is that certain failures will take place: the author bends reality to the needs of the tale. A good author does that well enough that someone without a grounding in the fields in question won't be able to spot the dubious leaps and assumptions. So no, I don't think fiction is the place to start any discussion of the future of biogerontology or the SENS vision. Not until we start getting a more useful class of fiction, anyway, which doesn't seem terribly likely. The truth and the reality of where we stand, what can be done with biotechnology, and what is needed to make progress - those are topics to focus on. "That which does not kill us, makes us stronger" This famous quote by Friedrich Nietzsche is exemplified by the phenomenon of "hormesis". Exposure of organisms to mild stress fortifies them against subsequent, more severe insults. Yet, the relevant molecular mechanisms remain poorly understood. [Small heat shock proteins, or sHSPs] constitute a diverse family of proteins with multiple roles. Several ageing theories suggest that longevity positively correlates with the ability of the cell and the organism to resist stress. Ageing influences both general and organelle-specific stress response pathways. Distinct experimental approaches have identified proteins that are abundant in long-lived worms. Intriguingly, the most consistently represented subset is the sHSP group, including the HSP-16 family. We propose that HSP-16.1 mediates its protective effect partly by preserving cellular ionic homeostasis, which is perturbed in the stressful context of ageing. How could sHSPs protect under unfavorable conditions? In stressed cells, ATP levels drop significantly leading to fatal aggregation of damaged proteins. sHSPs protect proteins from thermal denaturation and irreversible aggregation in an ATP-independent manner. We propose that sHSPs constitute one of the cell's first lines of defense against cell death. [On December 28th] Jiroemon Kiruma has set a world record. At 115 years 253 days he has become the oldest living man in history. The record was previously held by Christian Mortensen who lived to 115 years 252 days. Among supercentenarians being a male is particularly rare. The oldest living person in history was a woman named Jeanne Calment who lived to be 122. Currently there are 64 supercentenarians in the world (those 110 years and old) and only 4 of them are males. Kiruma is also the oldest living person in the world, a record he achieved when Dina Mafredini of Iowa passed away ten days ago. Kiruma has a strong will to live per family members, though presently he is in a hospital suffering from an illness of 10 days duration. His condition is noted to be improving. "His condition has improved, and we're not worried, but the doctors said it would be best if he stayed in the hospital into the new year," said Yasuhiro Kawato a hospital spokesperson. Kimura lives with his grandson's widow Eiko Kimura, and continues to eat three small meals per day, a strategy he has maintained for life. He is conversant and generally cheerful though now spends most of his time in bed. He has also escaped disease.